Benelli Adiva 125 (12 inch Front wheel/rear drum model) 00 Akumulator - firmy Nitro Wemoto - Części motocyklowe. Obrazek poniżej pokazuje Akumulator - firmy Nitro. Tysiące innych wysokiej jakości części zamiennych w niskich cenach . 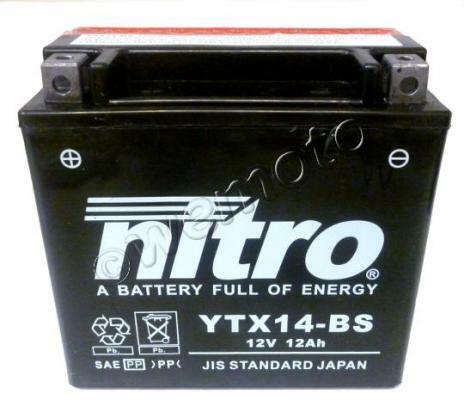 These great quality, great value batteries made to JIS standard are maintenance free; they don't require topping up. Once the electrolyte is installed, the only maintenance you need do is to keep it charged if the bike isn't in use, and the occasional clean. The electrically low resistant separator and heavy duty plates allow these Super Maintenance Free batteries to yield 30% more and faster starting power over conventional flooded batteries. The calcium grid reduces the self-discharge rate to only 0.2% a day against 0.5-1.0% for conventional batteries. Even if the batteries are left discharged for considerably long periods, a simple recharge will help restore full charge.